With the holidays here, you may find yourself happily anticipating the fun holiday traditions you have enjoyed with your friends and family year after year: Aunt Dorothy’s pecan pie, family Christmas carols around the tree or the special toast your best friends make every New Year’s Eve. Sometimes, however, those same holiday traditions can be difficult reminders of loved ones who have died. No matter how recent your loss, the holidays are often filled with memories that include happy times with those loved ones, and can make missing them feel fresh again. 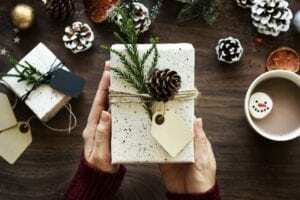 Maintaining those storied traditions can be one way to celebrate your memories, but starting new traditions may be another way for families to look forward to the holiday season. • Mix up your menu: Of course, holiday meals without your family’s secret recipes just wouldn’t be the same, but other parts of the meal may be up for grabs. One fun way to do this is to offer a dessert bar. Invite guests to a “bake-off” – no limits! — and present all the goodies together for sampling on a sideboard or countertop after the large meal has been cleared away. Guests can vote on their favorites and request them again next year. Non-bakers can contribute coffee with a flavored creamer or a selection of gourmet hard candies to tuck into pockets for the ride home. • Make time for play: Kids are always game for a bit of fun in the form of a scavenger hunt or family game night. Create a new tradition for kids and adults alike by introducing a board game tournament or divide guests into teams for “minute-to-win-it” games such as relay races or a cookie toss. Winner ducks dish duty for the day! • Create a living timeline: Plan an amateur family photo shoot and ask a friend to take a group picture. In coming years, take a photo in the same location to build a collection of timeline photos you can display every year. Extra credit goes to family members who wear the same silly hat or goofy tie year after year. Bonus: You can use the photo for your holiday cards. • Be your own crystal ball: As the holidays wind down, come together to make predictions about what the new year holds. Ask guests to pen their hopes and guesses for the coming year and tuck them into a large envelope. Seal it until next Thanksgiving, Christmas, Hanukkah or New Year’s Eve, and then tear the envelope open together to see whose predictions came true. No matter how you choose to celebrate the season, starting a new tradition for your family and loved ones is a great way to connect with one another. Newcomers can easily join in the festivities, young and old can spend time together and everyone can look forward to sharing in the celebration for years to come.